CDkeys.com is selling the game for 49.49€, while it "only" costs 47.99€ on Uplay with the points discount. CDkeys being the more expansive option is a bit unusual. has it been said if it will return to Steam after the year of Epic exclusivity expires? Ah, another game that wilingly lock out linux users. Nice. I've never played an Anno title before and I absolutely loved the beta this weekend. Will buy it next month. It's pretty much everything I was hoping it would be. Seems like the kind of game I could end up playing for hundreds of hours. Once I switched to Direct 12 the game looked incredible. The details and animations are so well done. Every new building was exciting to see and zoom in on. I'm looking forward to how mid-game diplomacy and trade work. Could be an instant classic. Be proud Blue Byte Mainz! I did have a lot of trouble with a quest 2-3 hours in where it wanted me to located a cousin leading a mob in the developed city, near a giant exhibition hall. I never found him. Anyone else have trouble with this? Did they ever mention a console port? They could even use the mouse and keyboard support of xbox/ps4... I can't find anything about that, so probably not. I just bought a PC yesterday because I stumbled upon a stream of the beta on saturday. Yeah, you read that right. Also, I never played an Anno game in my life. You need to zoom in and observe the mentioned place in the town of your nasty uncle. He´s probably not super close to the exhibition hall but definitely roaming the streets. Just look for a guy leading a protest. Ah ok, thanks. I looked and looked but couldn't find a mob. I'll find him in the full version. When the reviews dropping for this game? It feels like it will be a high scoring one this time. Played the beta for two hours yesterday and now i can't stop thinking about this game. First game in many years that brought back that old Caesar 3-feeling. What's the release time for the game? Same as the beta? 2am CET? At the risk of not being super helpful: I assume it'll be at some point today. The only hard evidence I have, though, is that a German games podcast (www.gamespodcast.de) will release their initial impressions at midnight German time (which is when they usually release their podcasts). Review embargo ends in 3 minutes. There was actually one for Wii but it really wasn’t the same game and used the pointer control. Your potato PC can probably run 1404, it’s on GOG if you never played it and it’s still fun today. If you are able to understand German these benchmarks here might be quite interesting :). The conclusion is that the game looks absolutely gorgeous. DX12 isn´t helping AMD cards at the moment. NV cards benefit slighty. The game is a beast on the CPU but still playable with 30-40 fps. They are using their own save game with a town that has 10.000 inhabitants for the benchmarks. How big is the game btw ? preload on pc was just shy of 24gb for me. uplay store. worth noting that AMD didnt release drivers for the game yet. I just received my Pioneers Edition, it's gorgeous, the art-book is big! Can't wait to play more tonight once it unlocks. That's some dedication. You are in for a treat. Anno is fantastic and this seems like the best Anno yet. 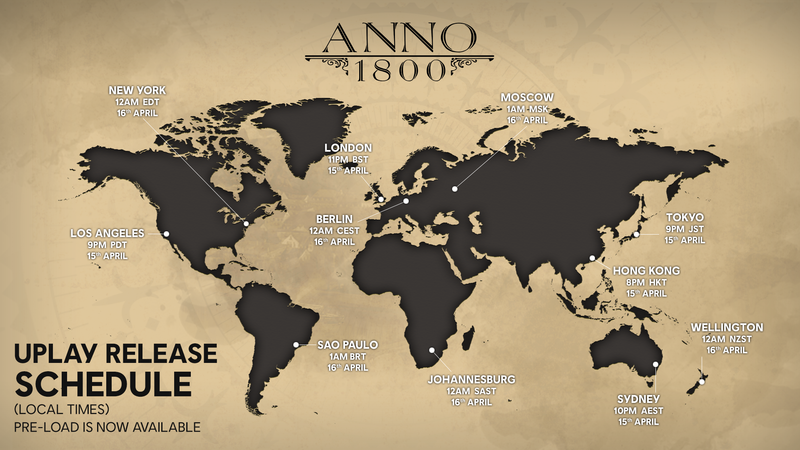 If you like it, also check out Anno 1404. Wait did I miss the open beta? Wait what, it unlocks today!? For everyone? You did. It ran for the past several days. Yikes. I even watched this thread but got no notifications. I was thinking about buying a new laptop in the next year or so, but those Anno vids made me do it way quicker than I thought! I'm in France, it unlocks at midnight, I'll play a bit before goind to bed. Midnight in Spain then. Thanks! Game can already be played via VPN on Uplay. I saw a season pass has been announced! Australia works as an unlock zone via VPN. Com_Raven Does it release later on Steam or should it be going up any second now considering it's out on UPlay? Wow I guess everyone is snapping up the game now before it goes away from 3rd party sellers and Steam? Top Seller on Steam and now green man gaming is sold out of uplay keys? I was just about to buy it from green man gaming too, feels bad man. Can't remember the last time keys were sold out before release for pre sale of a game. So the ubisoft store is down of course. is there any reason to not get this on steam? will it be available at midnight? Wow I guess everyone is snapping up the game now before it goes away from 3rd party selles and Steam? Top Seller on Steam and now green man gaming is sold out of uplay keys? I was just about to buy it from green man gaming too, feels bad man. Can't remember the last time keys were sold out before release for pre sale of a game. Yep, I was contemplating picking up the game, but going to hold off for a deep Uplay sale now since GMG sold out earlier today. It's annoying that the 20% off Uplay coupon only works in Europe for new releases. It should now be live on Steam as well. Thanks. Was gonna reply earlier but then I spent 2 hours playing the game... RIP time. The Pionieers Edition is really great. The artbook is just amazing. Very well done!